HUGE Lot of 48 Edwards Coffee Ads, 1933-1937 - NICE!! Vintage Paper Ads > Clearance Lots > HUGE Lot of 48 Edwards Coffee Ads, 1933-1937 - NICE!! 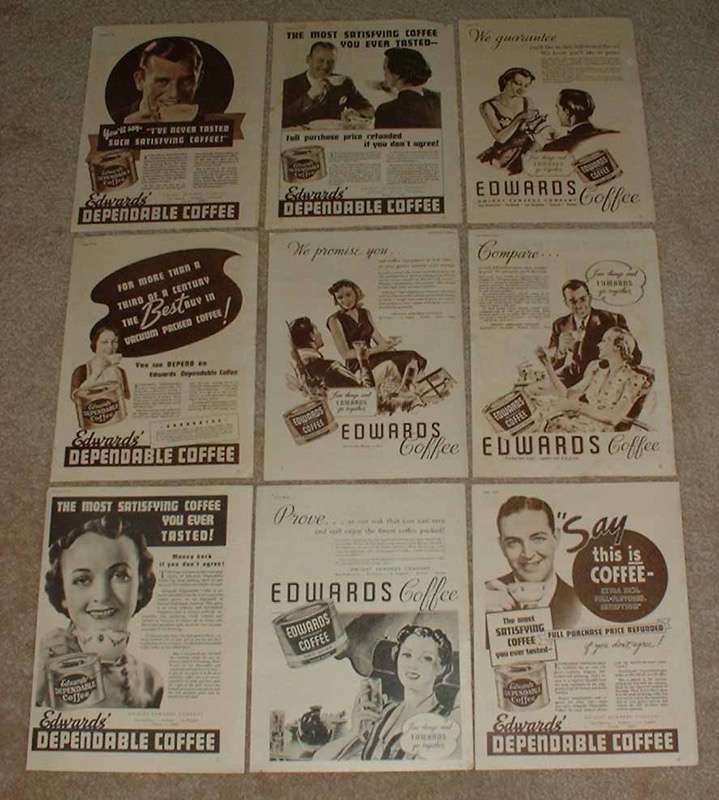 This is a huge lot of Edwards Coffee ads, ranging from 1933-1937! There are a total of 48 ads, although I just realized that two of those are actualy Airway coffee ads (the two with the different types of coffee machines). These ads are mostly either approximately 8.5x11 inches or 5.5x11 inches in size. The ads are in good condition overall, although some may exhibit slight staining, creasing and/or other wear. These vintage ads would look great framed and displayed! Add them to your collection today! HUGE Lot of 49 Edwards Coffee Ads, 1938-1941 - NICE!! Large Lot of 12 Jantzen Fashion Ads - 1951-1984 - NICE!